A VIGILANTE group ­has attacked a teenage gang’s ringleaders in a bid to put a stop to their reign of terror. The crowd — who named themselves after the famous US biker gang Hell’s Angels — have fought back after the young thugs left people in parts of west Dublin ­fearing for their lives. 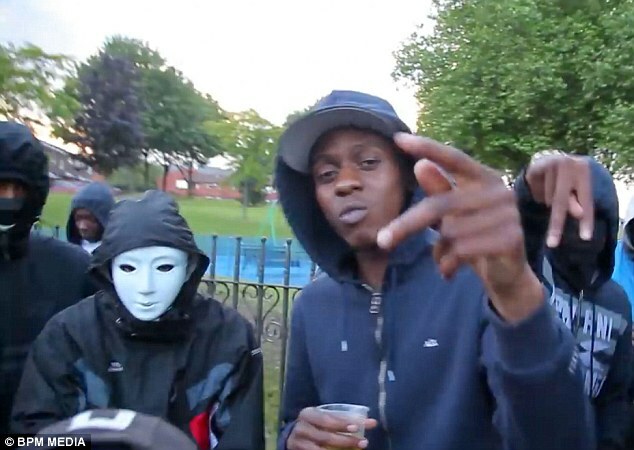 The black invaders are classified as teenagers and attend school in the daytime, but in reality most are in their twenties and thirties and lied about their age to escape deportation – “They may be teenagers in age [a lie] but they are big strong men in size and are not afraid to flex their muscle to anybody, including gardai.” said a police officer. We told yesterday how the teen mob have been behind a number of vicious assaults, ­robberies and even threats on the lives of gardai. Locals say the yobs — who move between Blanchardstown and out into north Co Dublin— have left parents too scared to let their kids out to play and pensioners terrified. But we can reveal that ­vigilante group ‘Hell’s Angels’ took matters into their own hands by attacking two of the gang’s leading figures. The local police were just too frightened to arrest the black invaders. “We’ll get uppity” screamed one wolly haired malcontent. A source told the Irish Sun: “Gardai are working tirelessly to put a stop to these lads, but their hands are often tied due to a lack of resources mixed with the lack of fear from these guys. They have no respect for the law. We revealed yesterday that the gang, with African origins, are being “left to run amok” by gardai because they don’t have the resources to deal with them. Sources said the hoods are “arrested every week” but cops risk setting off “a mini riot” every time they decide to nab one of the youths. I sure hope Ireland’s Men will find their proverbials before these hoods ruin the country. We need to start deportation of all these illegal immigrants who entered Ireland illegally and have claimed asylum Illegally, start giving refugee status for 2 years max and no cash benefits, review after 2 years, and return to home country.